Lovely collectible Susan Branch Cups, stamped on the bottom "Fine Bone China, Made in England." Imported from "the potteries" in Staffordshire, England; 11 lovely ounces (filled to the very top), perfect for tea, coffee, hot chocolate, soup, stew, and Irish coffee (plenty of room for whipped cream), with Susan's charming art on front, back, handle, and bottom of each cup. Dishwasher and Microwave Safe. Four new designs for Summer 2018: 4th of July, Red Letter Day, Garden (all 16 oz. ), and our 11oz. 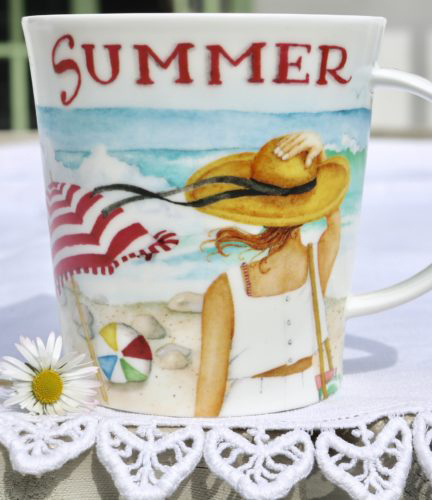 Summer cup. (Each cup is sold separately, OR (less expensively, pre-orders only), in a group of four that includes one of each cup).